oSelect the Products category in the tree and click the Add Product button. (You can also right-click on the Products category in the tree and select Add a product...). 1.Enter the name for your application. 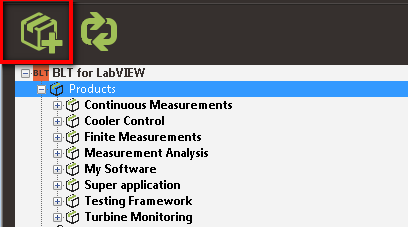 2.Select your LabVIEW Project file. This must be the path of the LabVIEW Project containing your application. oYour Product appears in the tree, you can now Configure its attributes. oSelect in the tree the product(s) you want to remove. You can select multiple entries by pressing the Ctrl key of your keyboard. oClick on the Delete button in the menu bar and confirm. The selected product(s) will be deleted from BLT. 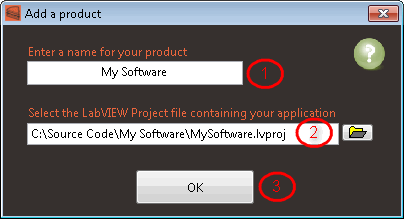 You can still access your LabVIEW source code directly with the Project file, but you will not be able to manage the distribution with BLT anymore. See here how to remove all BLT dependencies from your project.